The Presbyornithidae are abundant birds in some early Paleogene fossil localities of the New World, and have a confusing history concerning both their taxonomy and their phylogenetic assignment. The first remains, a few isolated bones from the early Eocene of Utah, were described by Wetmore (1926) and assigned to the charadriiform Recurvirostridae (stilts and avocets; Presbyornis) and Alcidae (auks; "Nautilornis"). Howard (1955) subsequently described specimens from the Eocene (Casamayoran) of Patagonia as Telmabates antiquus. She tentatively referred this species to the Phoenicopteriformes, but also made comparisons with Charadriiformes and Mesozoic stem group representatives of Neornithes. It was not until Feduccia and McGrew (1974) reported new material of P. pervetus from the early Eocene of Wyoming that Presbyornis and Telmabates were classified in the same higher-level taxon. Ericson (2000) revised the New World fossil record of the Presbyornithidae and confirmed validity of four species: the large Paleocene P. isoni Olson, 1994 (Olson 1994; Benson 1999), as well as the early Eocene P. pervetus Wetmore, 1926, P. recurvirostra (Hardy, 1959), and T. antiquus. Except for the latter, all of these species occur in North American sites. T. howardae Cracraft, 1970 from the Eocene (Casamayoran) of Argentina was excluded from the Presbyornithidae by Ericson (2000), who regarded the affinities of this poorly known species uncertain. Remains of putative Presbyornithidae were also identified from the late Cretaceous of Mongolia (Teviornis gobiensis Kurochkin et al., 2002), but their classification needs to be confirmed by additional and more complete material (Kurochkin et al. 2002, see also Clarke and Norell 2004). Likewise presbyornithid affinities of Proherodius oweni Lydekker, 1891, whose fossil record consists of a poorly preserved sternum from the early Eocene London Clay, are not well based (Olson 1985; contra Harrison and Walker 1978). Although the best-represented presbyornithid species, P. pervetus, is known from numerous bones, no articulated skeletons have as yet been found. P. pervetus combines a duck-like skull with very long legs, and its postcranial skeleton is quite different from that of extant Anseriformes. The caudal margin of the sternum exhibits two pairs of incisions, whereas there is only a single pair in all extant Anseriformes. Also unlike in all extant Anseriformes, the pneumotricipital fossa of the humerus is very shallow and lacks pneumatic foramina, and the ilia are not fused with the synsacrum. As evidenced by T. antiquus, the caudalmost thoracic vertebrae of presbyornithids are further opisthocoelous (Howard 1955), whereas they are heterocoelous in extant Anseriformes and most other neornithine birds. As yet no detailed and comparative descriptions of the skull of presbyornithids have been published. However, it has been noted that these birds differ from crown group Anseriformes in proportionally shorter postorbital processes, the absence of a caudal inflation of the ventral portion of the quadrate, and the presence of well-developed temporal fossae (Olson and Feduccia 1980a). Presbyornithids were filter-feeding birds which probably nourished on planktonic organisms in shallow, saline lakes (Olson and Feduccia 1980a; Feduccia 1999). 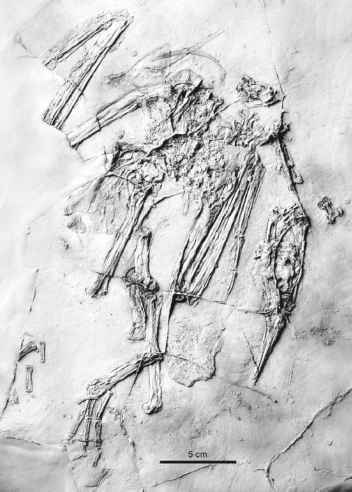 At least the taxon Presbyornis may have been sexually dimorphic in size (Ericson 2000), and judging from mass mortality layers with thousands of bones, mainly at Lake Gosiute of the Green River Formation, appears to have been highly gregarious (Olson 1985; Ericson 2000). Trackways from the Green River Formation of eastern Utah which were allocated to P. pervetus by earlier authors were described as Presbyorniformipes feduccii [sic] by Yang et al. (1995). If correctly identified, they provide evidence not only for the presence of fully webbed anterior toes and a long hallux in Presbyornis, but, through the presence of dabble marks, also for the feeding behavior of this species. Eggshells of Presbyornis were reported by Leggitt and Buchheim (1997). Like few other fossil birds, presbyornithids were cited as "missing links" to support phylogenetic hypotheses. Before the skull was discovered, they were considered to be most closely related to either charadriiform birds (Wetmore 1926) or the Phoenicopteriformes (Howard 1955; Feduccia and McGrew 1974; Feduccia 1976). Feduccia (1976) hypothesized that the skeletal morphology of presbyornithids constitutes evidence for a close relationship between the Phoenicopteriformes (flamingos) and Charadriiformes (shorebirds). Anseriform affinities of presbyornithids were assumed by Harrison and Walker (1976a, 1979a) and became widely recognized through the publication of Olson and Feduccia (1980a), who cited the mosaic character distribution displayed by Presbyornis in order to establish a charadriiform ancestry of the Anseriformes. Olson and Feduccia (1980a, p. 22) considered presbyornithids to represent "a charadriiform grade of morphology", and Olson (1985) listed them as "transitional shorebirds." By contrast, the Presbyornithidae resulted as a sister taxon of the Anatidae in cladistic analyses of Ericson (1997) and Livezey (1997). Ericson (1997) identified only a single character as a possible apomorphy of a clade including the Presbyornithidae and Anatidae, the presence of a pneumatic foramen on the medial process of the mandible. Livezey (1997) did not list the character evidence for his phylogeny, but mentioned that fully webbed anterior toes, whose presence can be inferred for Presbyornis from the above-mentioned trackways, are a synapomorphy of the Presbyornithidae and Anatidae. Most likely, the long legs of presbyornithids are an autapomorphic feature, and certain peculiarities in which presbyornithids differ from other Anseriformes may be related therewith. In particular, this seems to be true for the morphology of the caudal margin of the sternum and the large cnemial crests of the tibiotarsus (Mayr 2008f).